Restaurant Features: Recipes, location and GPS coordinates, fun facts and a "Don't Miss" tip about each restaurant's signature dish. "Rubbernecker Wonders": Reviews of kitschy roadside attractions worthy of gawking, such as the legendary Cadillac Ranch in Texas. Food Finds: Purveyors along the route who offer the very best local products - from honey and barbeque sauce to cornbread dressing and spices. Food Festivals: Annual food events to hit up during your travels. Travel writer, food critic and humorist Morgan Murphy, former Southern Living Travel Editor, has written for Forbes, Vanity Fair, Esquire and The New York Post, among other notable publications. He holds an MBA from Oxford and has won several journalism awards, including the coveted Society of American Travel Writer’s Gold Award. An officer in the U.S. Navy, Lt. Commander Murphy just returned from a tour of duty in Afghanistan. 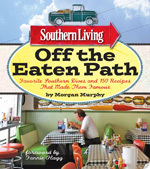 Oxmoor House, a Time Inc. company, publishes books and special edition magazines for Time Inc. brands such as Southern Living, Cooking Light, Health, and Sunset. Oxmoor House’s client list also includes Williams-Sonoma, Weight-Watchers, and Weber. With more than 300 back listed titles, it is recognized as one of the leading lifestyle publishers in the country. Oxmoor House books are distributed to the trade by Hachette Book Group and are available wherever books are sold. More information is available at www.oxmoorhouse.com. Southern Living, published 12 times a year by the Time Inc. Lifestyle Group, is the nation’s sixth-largest monthly consumer magazine, reaching nearly 16 million readers each month. Founded in 1966, Southern Living offers today’s busy Southern woman achievable ideas for cultivating her own Southern style. Each month in the magazine and on southernliving.com, readers find ideas for cooking, gardening, gracious entertaining, decorating, regional travel and locally made products.